Where else can you find a set like this? This versatile set of pots and pans and assorted accessory pieces is ideal kitchen equipment for any cook's food prep area. A unique feature of this 28-Piece 12-Element Stainless Steel Waterless Cookware Set that enhances healthier eating is a temperature control knob on each lid. This helps control how high the heat goes and how long you might want to allow the ingredients to cook. Waterless cookware permits cooking with little or no additional moisture so that foods retain a greater degree of their minerals and vitamins. 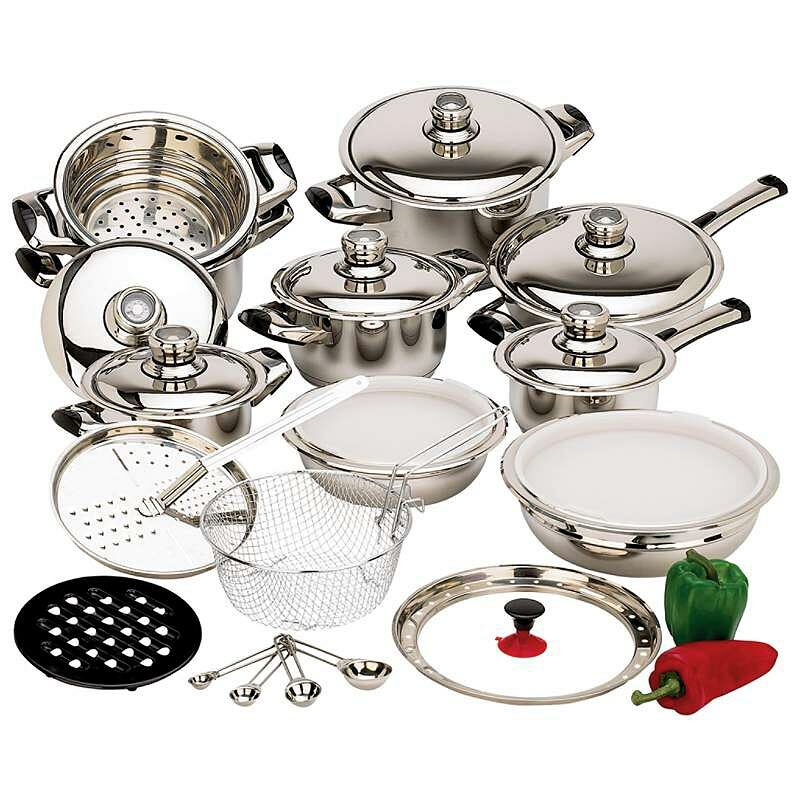 The step steamer pan will fit four of the different sized sauce pans in this high quality stainless steel cookware set. 4 piece measuring spoons set Suction cup knob for mixing bowls to convert the bowls to dome covers. 12-element surgical stainless steel is extra sturdy for durability and performance. Riveted handles Are stainless steel capped for security and ease in using. Adaptable mixing bowls Can serve as double boilers, or convert to dome covers if you are doing stove top braising. Step-steamer Will fit the saucepan or four casserole sizes. Temperature control knob on each lid Aids healthier eating. Knob alerts you to when the ideal cooking temperature has been reached. Then the food can be monitored and not overcooked, thus retaining vitamins and minerals. Polished stainless Looks lovely in any kitchen decor.